Chinese cupboard, although inspired by foreign cultures also refer to the habits and beliefs of the chinese. These hutches chinese often made of solid elm are relatively low, their facade is adorned with hardware at the level of the hinges and handles. The low height of the furniture of Asia can serve as a bench or piece of furniture tv-HiFi. Antic chinese cupboard There are 11 products. Chinese Buffet carved of the opera Zaju. 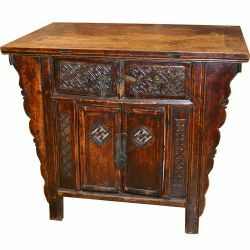 Grand buffet, chinese antique carved solid elm.Dimensions: L240 x P66 x H100 cm.